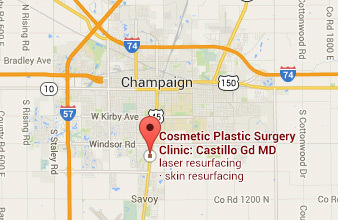 Plastic Surgeon Reviews for Bloomington & Champaign | G.D. Castillo, M.D., F.A.C.S. Find out what people are saying about Dr. Castillo by reading his online reviews. I would recommend Dr. Castillo for any of your cosmetic surgery needs. I am very pleased with my results and will continue to see Dr. Castillo for any future procedures. All of the staff are wonderful! I was so impressed with Rowena's customer service the first time I called the office that I didn't forget Dr. Castillo's office when I was ready to have my procedure a few years after that initial call. Dr. Castillo is caring, compassionate, and willing to explain the procedure in detail. Thank you all!!! After a lifetime of poor choices such as smoking, nutrition, and sun tanning, my face had accelerated signs of photo aging and clearly displayed my decisions. I sought professional solutions and after consulting with three different cosmetic physicians in Champaign, I decided to go with Cosmetic Plastic Surgery. I choose them because I was not pressured, and instead was clearly informed of what solutions would be optimal and those that would not. In the end, I opted for CO2 Micro-Fractional Laser Resurfacing and my results are phenomenal. I wholeheartedly recommend this clinic as I believe you will not find a better group of cosmetic professionals downstate. The care and concern extends beyond the procedure. Beyond this, it works. I have at least 10 years removed from my face, in a relatively short amount of time and with minimal discomfort. If you are considering a new you, I recommend you schedule an appointment with the Cosmetic Plastic Surgery Center. The professionals are stellar and I believe you will not be disappointed! I bypassed the Bloomington cosmetic surgeons for Dr. Castillo to do my surgery. The staff is very kind and professional. The anesthesiologists were top of the line and very reassuring. The operating room was clean. Office is beautiful. My face lift was a walk in the park. No pain but I did have bruising. My results were better than expected. The scars cannot even be detected. He's a wonderful,talented surgeon. I would recommend Dr. Castillo to everyone. My first surgery by Dr. Castillo was in 1976 when he corrected a deviated septum and changed my life...not only allowing me to breathe easier, but also improving the shape of my nose. Now, 35 years later, through his superior surgical skill, he removed a cyst from above my eyebrow, lifted my eyes and laser resurfaced below my eyes. The unsightly bump is gone and my eyes look 15 years younger. Dr. Castillo's skills are exceptional, and he treats you as if you are his only patient--taking time to clearly tell you what will be done and answering any questions you might have. His knowledgeable and professional staff are also very caring and provide personalized service. I moved away from Champaign, but returned to Dr. Castillo for my recent surgery because I would not trust anyone else to produce the results that Dr. Castillo does. My first visit to Dr. Castillo was to correct some very bad surgery performed by a doctor I found in the Yellow Pages. This, itself, was to have repaired damage done to my eyelid to remove a cyst, when I was 14. Dr. Castillo was horrified to see what had been done, and cautioned me that he could only promise to improve my present condition. The outcome was nearly miraculous: everything was repaired, leaving no sign of the problems that brought me to his office.Later I was to learn that Dr. Castillo consistently does magnificent work. He has a precise knowledge of anatomy, and an uncanny ability to see what results will be achieved through surgery. I wonder how many plastic surgeons have such an artists eye along with a keen mechanical sense of how tissues will react and heal.An important aspect is that Dr. Castillo never tries to convince a patient to have surgery. His predictions of results are always realistic, and he takes pains to explain the details of a proposed procedure. Post-operative care at his clinic is elaborate and generous, and his staff is both highly knowledgeable and pleasant. I recently had laser resurfacing of my upper and lower eyelids. The results were dramatic, much better than I ever imagined. For years I have not looked at myself in the mirror, now I can't stop admiring the results! I have to also commend Dr.Castillo and his staff for their outstanding compassionate and personalized service. Dr. Castillo is honestly one of the most educated cosmetic surgeons in Champaign County & he's the best known in the area for a reason. I have had a previous cosmetic surgery and I was completely dissatisfied. He truly goes out of his way to make his patients happy. He fixed everything that had been messed up by my previous surgeon, and even made a personal call to make sure I was doing okay the day after my operation. Dr Castillo is one of be best plastic surgeons I know. His work his outstanding, he is honest with what results you can expect. I have been seeing Dr Castillo for many years. He is kind , understanding and extremely knowledgeable. Before, during and after surgery he is there for you with any concerns you might have. His staff in the office is the best I have ever seen. My next procedure will be with Dr Castillo only. Thank you to Dr Castillo and his staff for helping me feel good about myself again. I saw Dr. Castillo for a tummy tuck about 5 years ago and my only regret was not having it done sooner. I am completly thrilled with the results and am contemplating a lower face lift. I wouldn't go to any other Dr. because I trust Dr. Castillo and know how talented he is. Additionally, Dr. Castillo has a wonderful staff. His nurse, Stephanie, makes me feel comfortable and is very reassuring. I have been seeing Roxanne, the skin care specialist for several years. She is very knowledgable about skin care and I continue to see her monthly for treatments. Roena at the front dest is also very accomodating. My experience at Cosmetic Plastic Surgery has always been positive and I would highly recommend it to anyone considering cosmetic surgery. Dr. Castillo is a phenomenal cosmetic plastic surgeon. I have been utilizing his expertise for over 15 years, and have never been anything but thrilled with all of the procedures he has done on me! Part of this is because he has always given me a full explanation of what to expect and the time frames in which to expect the procedure to reach the full effects. His main goal is to please his patients with the best outcome for each patient individually. The staff is great and handles each client’s case as implicitly confidential. My two favorite staff personnel are Rowena and Stephanie; they are always smiling and ready to answer questions and make me feel comfortable. I will continue to recommend Dr. Castillo. He is a truly gifted surgeon and has an excellent staff, facility and practice as a whole! Visit Dr. Castillo's website for more patient testimonials. D.S: Thanks to Dr. Castillo, Roxanne and staff, I feel in control of my future. After my treatment I looked 10 years younger and felt it too. Everyone is so helpful even getting me a room rate nearby at a first class hotel. The hotel dropped me off and picked me up after the procedure. All very private. I am looking forward to a bright future with the help of Dr. Castillo and staff. Dr. Castillo is AWSOME! I had eye surgery and a forehead lift. I was so pleased with the results and all the personnel; I decided to have a facelift. After my surgery I met with Roxanne who helped me get started on some fantastic facial and make-up products. Roena, Stephanie and Roxanne make you feel so welcome and special. After such amazing results and compliments on my face, I decided to have liposuction to get rid of my saddlebags (ALL GONE), stomach, and inner thighs! Dr. Castillo was professional, thorough in explaining the entire procedure, and caring. Imagine a doctor PERSONALLY calling you following a procedure to check on you and your comfort. I cannot sing Dr. Castillo enough praise, this Doctor rocks! Dr. Castillo is Excellent! Very thorough, very kind and caring. His technical skill is great but his aesthetic sense is amazing. It's the art of plastic surgery that can't be taught – he has a great surgical "eye." I would recommend him to anyone. J.C: I am a 66 year old male who had a CO2 Micro-Fractional laser treatment to remove unsightly age spots on my face. The procedure went exactly as planned with minimal discomfort. I was pleasantly surprised that I not only have lost the discoloration, but most of my wrinkles were reduced or gone. My wife is thrilled. Dr. Castillo's staff was extremely helpful and efficient from the evaluation through follow up calls and appointments. The results were better than expected and with their suggestions for proper skin care. I look forward to looking much younger for many years. I couldn't be happier and would recommend Dr. Castillo to anyone needing or wanting to improve their skin's appearance. S.B: Excellent!! Very friendly & knowledgeable in their areas. Facility is wonderful, calm. P.G: Everyone seemed concerned and helpful. My wishes were met. I liked the honesty of expectations. 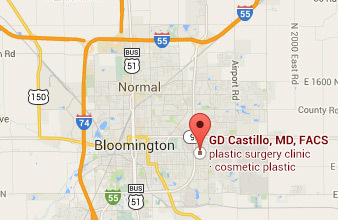 Dr. G.D. Castillo is a cosmetic plastic surgeon serving the Bloomington and Champaign, Illinois, areas with decades of experience. He is certified by the American Board of Facial Plastic and Reconstructive Surgery and the American Board of Cosmetic Surgery. After earning a medical degree from Mexico's National University, Dr. Castillo completed internships in Colorado and Virginia and residency programs at Henry Ford Hospital and Wayne State University in Detroit. He is a member of several professional organizations, including the American Academy of Facial Plastic and Reconstructive Surgery and American Academy of Otolaryngology - Head and Neck Surgery. He is a past president of the American Academy of Cosmetic Surgery as well as the past president of the American Society of Liposuction Surgery. At his private practice, Cosmetic Plastic Surgery Center, Dr. Castillo offers Bloomington and Champaign-area patients a range of surgical procedures for the face, breasts, and body. His most popular procedures include breast augmentation, rhinoplasty, facelift surgery, liposuction, and tummy tuck surgery. His practice also provides non-surgical treatments and skincare services such as BOTOX® Cosmetic injections, dermal fillers, laser procedures, and skin resurfacing.